I was down in Southern California visiting family when it came time to pack up and head north. I was lulled into a state of dormancy by the less-than-10-degree swings in temperature between night and day, and the muted earth tones that adorned every stucco-covered building no matter where you looked. Even the sky was a muted earth tone during the day, changing into a reddish-orange paste as the sun set well before where I imagined the horizon to be. There were three ways of getting out of LA — on Southern Pacific, Santa Fe, or Union Pacific, and for some reason I chose the latter. My brother gave me a ride out to UP's East LA yard and I immediately walked over to the nearby Denny's and fueled up on coffee and a short stack. As was my habit at this particular place, I payed for my meal in advance, as the UP departure yard tracks ran right outside the windows and on more than one occasion I had to gulp one last swallow of coffee and bolt out the door to catch a train pulling out of the yard. I wasn't in any real hurry to leave, but I would much rather spend my time looking at desert scenery instead of the Golden State Freeway. I managed to finish my breakfast, then I hit the back of the adjacent gas station for a large chunk of cardboard. As I was trying to fold it into a packable size I heard a train pulling out of the yard so I stuffed the cardboard under my arm and walked around the building to a deep gully next to the tracks, where I laid down and was hidden while the engines pulled by. Just as I made my way up the embankment to look for rides the train started to speed up, and I had no choice but to throw my cardboard on the front of a grainer and climb up after it because it was oriented the "wrong way". As we sped along I'd glance backward whenever we came to the slightest hint of a curve in order to look for a better ride, but it looked like nothing but closed up boxcars and a few closed up autoracks. About an hour out of town we slowed to a stop on a siding next to a large business park, and when we broke air I knew we were going to make a pickup. 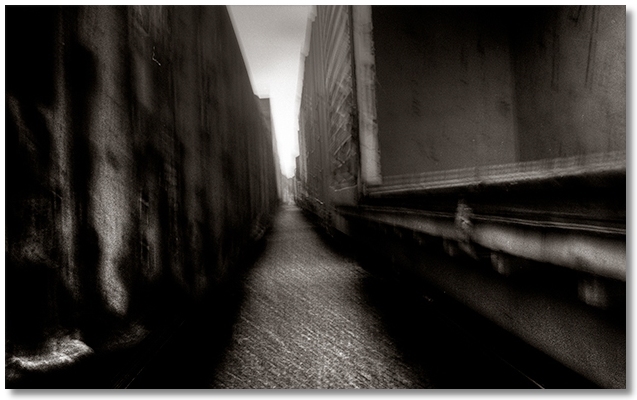 On a nearby track was a string of boxcars, and one had a door partially open on my side. I jumped down and walked over to see if I could open it further and to my surprise it rolled open and clinked as if it were on ice. I walked over to the end of the car and climbed over to the other side to see if I could get the other door open. Unfortunately there was an intact seal still in place, but with a few twists with my knife it broke and I was able to open the door all the way. While I was doing this the brakeman who was on the ground to connect everything together was watching me fiddle with the seal, and I tried to act casual and hope that he realized that the car was empty and I wasn't stealing anything. 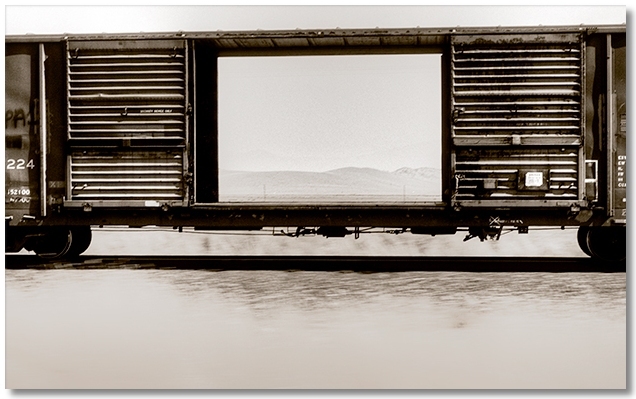 As soon as we connected to the new cut of cars and began to air up I transferred my gear to the boxcar and breathed a sigh of relief, as riding on the front end of a grainer in the desert is a very "sandy" ride, to say the least. After sitting closed up in the sun for who knows how long the inside of my new conveyance was pretty hot, but once we got moving again I rolled out my stuff in the rear of the car and things cooled off nicely. In no time we had left the wasteland of suburbia behind and were slowly making our way up Cajon Pass, the gateway to the High Desert and eventually Nevada and Utah. I waited until this point to break out the White Port and had a very pleasant ride up to the top of the pass, where we picked up speed on the flat desert landscape and it was time for my afternoon nap. I knew in an hour or so we'd have to pass through the Santa Fe yard in Barstow but we shouldn't have any reason to stop until we got to the crew change in Yermo. I was awakened from a delicious slumber when we came to a halt on the mainline that runs through the Santa Fe yard. Thinking that we must be waiting for clearance or whatever I fell back to sleep, only to be awakened again a few minutes later by a loud voice calling out "Railroad Police". I sat up and looked toward the doorway of the boxcar and saw a guy standing up already inside the car wearing a Navy blue jumpsuit and a holster. He called out in no uncertain terms that I should gather up my gear and exit the train. When I started to stuff my sleeping bag in the pack he practically blew a gasket and yelled "Out of the car, now! ", or words to that effect. Sadly, I had to throw my sleeping bag (which I had just washed laboriously at my Mom's house a few days ago) on the ground, along with everything else, although I did manage to gently set down my pack after telling the officer that it was fragile because of a camera inside. This was true, but my greater concern was for the other two bottles of White Port inside, which were supposed to last me until Salt Lake. After loading my gear in the trunk of his car and me in the back seat, I felt that I would never see those bottles again, which turned out to be true. If there was a "good" part of getting driven away in the back seat of the Bull's car, it would be that I was able to see the layout of the rest of the freightyard, and not just the departure area that I spent most of my time in. Eventually we made our way into town, which thankfully was close by, as the handcuffs were killing my wrists. As we turned into the parking lot of the jail, a busload of inmates passed us coming out, and I was to learn later that as it was a Thursday night and the Barstow jail was small, everyone was transported down to the county seat in San Bernardino on weekends to await trial on Monday morning. This was good news because it meant that 1) I didn't have to undergo a crowded two-hour bus ride and end up where I didn't want to end up, and 2) I would have the entire jail to myself. After booking and getting placed in a two-person cell, I immediately grabbed the upper bunk and tried to get back to sleep, but I soon realized that the "entire jail to myself" thing wasn't going to last long, as every time I would drift off to sleep they would bring another poor soul in from the street. There was a long hallway with cells on either side, but they were staggered, so that there wasn't a cell directly across from mine. This meant that as the night wore on, and more and more "guests" were brought in from mostly alcohol related offenses, it seemed, I couldn't see anyone unless they pressed themselves up against the bars. This meant that although I could hear lots of conversations going on, and many in Spanish, I never got a chance to actually see who was doing the talking. It ended up that because of a backlog of court cases, I wouldn't be able to see a judge until Tuesday, which meant that I'd end up spending 5 days in jail for the heinous crime of riding in an empty boxcar. Well, at least I didn't have to be anywhere, and for the first two days I had the cell to myself, but late one night I was again awakened by another inmate being brought in, and this time he was being put in with me. I knew something was wrong right away when I saw, through a squinted eye while trying to feign being asleep, that this guy was escorted by two deputies, while everyone else only seemed to rate one. When the door slid open and he was brought inside I saw why two were needed — this guy must have been 7 feet tall and very drunk. My top bunk, which at this point I was ready to relinquish immediately at my cellmate's wish, was about shoulder high to me, but it seemed to be about waist high to the new guy, who appeared to be Native American and very disapproving of White People, as he kept muttering to himself that he was going to kill the next White guy he came across. As soon as the deputies left and the cell door slid shut I was wide awake, to say the least. Trying my hardest to appear sound asleep (and harmless) I tried to come up with some sort of a plan of action should he get combative, but short of throwing a roll of toilet paper at him I didn't have many options. After he staggered around the cell for a minute or two, swearing all the time, I was intensely pleased to hear a loud thud and the swearing ceased. I gingerly opened one eye and saw that he had passed out on the floor, and was now faced with the dilemma of whether to go back to sleep or stay awake. Apparently I chose to go back to sleep as I was awakened yet another time when the deputies opened the door and somehow stood my cellmate up and walked him away, as supposedly someone had posted his bail. From the way the deputies treated him it was apparent that this wasn't his first rodeo, as the saying goes. After the first few days I got into the habit of trying to doze off at any opportunity, as the evening hours tended to get very noisy with almost all of the bookings occurring after my normal "bedtime". I lucked out and kept the cell to myself the rest of the time, and on Tuesday morning I was presented with more good news — myself and anyone with "lesser" offenses would appear before a judge in the same building, rather than be transported to San Bernardino. I was ecstatic, but now I began to have doubts as to just how I would get out of town once I was released. The freightyard seemed the obvious choice, but I was a bit apprehensive after my arrest. At this point I was too dirty to hitchhike (not to mention having zero interest in doing so) and I'd almost rather go back to jail before I took a bus anywhere, so it was time to start to lose my fear of being caught on railroad property again and start planning my escape from civilization. When we were escorted into the courthouse I saw that there were only about 9 of us who were guilty of whatever constitutes a lesser offense in that county, and for once I was glad that my last name began with the letter "V", as we were taken alphabetically and I need time to size up the Judge before I spoke a word about my crime. As each person stood up and faced the Judge to offer some sort of valid reason why they committed their crime, I heard some very creative stories, almost bringing me to the point of laughing out loud, and I honestly don't know how the Judge kept a serious expression during the monologues. He'd make a good poker player, I thought to myself. As each defendant tried to convince the Judge that they were mistakenly charged and therefor undeserving of any punishment whatsoever, I began to notice a scowl beginning to form beneath the Judge's stern expression, and it told me that he was getting tired of hearing excuses. That was it — I wouldn't offer him any. In fact, I briefly toyed with the idea of, just to appear as a refreshing change of pace, telling the Judge in no uncertain terms that I was arrested for riding freights and I would do it again in a heartbeat. Fortunately coming to my senses just as my name was called, I settled for the story that I merely wanted to visit friends in another state and I didn't have money for car or bus fare, and hitchhiking was dangerous. Startled that I could keep a straight face during the utterance, I noticed an imperceptible sigh of relief in the Judge's expression, and I was credited with time served and slated for release. After seeing a clock in the courtroom for the first time in several days, I thought that I might get out as soon as noon, and I need to figure out how to occupy myself until it got dark, because there was no way I was going back to the freightyard during the day. A funny thing happened when we were all ushered into the courtroom — I was finally able to match the voices I heard in adjacent cells to their real bodies, and it was quite surprising. On one side of me back in the cell I heard someone with a deep, almost menacing voice, and imagined him to be a large, threatening sort of a person in real life, but when I matched his voice up to his human form he was actually very short and bookish-looking. Another "voice" that I associated with a sort of slight, effeminate-looking person came back to match a sizeable Black guy who looked like he had no one (except maybe the Native American) to fear. The afternoon wore on and on, and I was finally brought out of the cell with a few other inmates at almost 9 o'clock at night! The excuse was that our "paperwork" was late in getting there from San Bernardino. Just as I thought, my pack was now lighter by the weight of about two bottles of White Port, so as I hit the street I asked the short guy with the deep voice if he knew where a liquor store was, and indeed he did. We both walked along finishing up conversations we started back in jail, then hit the liquor store right where he said it would be. To my extreme delight they carried White Port, though given the surrounding neighborhood it seemed like a no-brainer. I scooped up a few bottles and followed my new friend to a nearby bar, where I could kill time until it got really dark and build up my nerve to re-enter the freightyard. I comforted myself with the idea that the freightyard should be last on the list of places to go for someone who just got popped there, so nobody would be looking for me, right?